It's fair to say I'm obsessed with Breton tees. Chic, timeless, effortless - you really can't go wrong with a simple stripe. With most of us owning a Breton top of some incarnation, I thought I'd put together a feature on how to update yours for SS14. Don't just reserve your Breton for weekend wear - consider it as neutral piece [like a grey marl sweater or a white t-shirt] and wear it with patterns and prints. The below orange Baum und Pferdgarten number has a Simone Rocha feel and clashes artfully with a navy stripe. Heads up: if you're tight on budget, I've spotted a similar skirt from F&F for a mere £25. For an effortless weekend look you can't beat a Breton + boyfriend jean + cross body bag ensemble - I love Next's patchwork denim. Finally, your trusty tee will make a stylish beach cover-up [although anticipate replacing it post-holiday, suncream leaves yellow stains!]. I'd wear mine with big shades for a touch of parisian chic on the sands. Work: Breton tee, Iris and Ink at The Outnet, £45. Orange floral lace pencil skirt, Baum und Pferdgarten, £139. Lips in Whimsical, Topshop, £8. Laminated silver slingbacks, Massimo Dutti, £69.95. 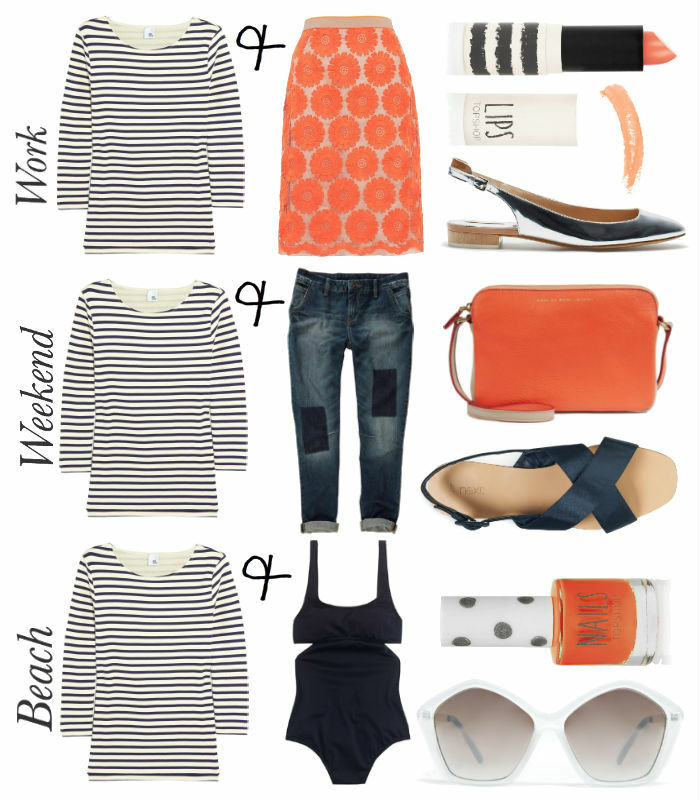 Weekend: Breton tee - as before. Boy fit jeans patch-detail jeans, Next, £30. Marc by Marc Jacobs Dani orange cross body bag, Harvey Nichols, £175. Navy satin cross strap sandals, Next, £26. Beach: Breton tee - as before. Navy cut-out tank swimsuit, J.Crew, £88. River Island Penelope white sunglasses, ASOS, £13. Nails in Saffron, Topshop, £5.